Today we had booked a tour of the Tsukuba Space Centre, which is managed by the Japan Aerospace Exploration Agency which is more commonly known as JAXA. The tour is free, but you have to book in advance by phone. Kate did this before we left for Japan. She had a bit of trouble as although the person spoke English, they had a very strong accent and could not understand what Kate was saying. Anyway, our tour started at 11am and we were told to arrive 15 minutes early at 10:45 for registration. Although the Tsukuba Express train runs from Akihabara to central Tsukuba, the location of the Space centre meant that it would be easier for us to get a bus from the Tokyo Station Yaesu (八重洲) south exit bus stop. The bus stopped right outside the space centre and meant we would not have to change. Unlike yesterday’s trip to Mt. Fuji, we didn't have time to search for the stop beforehand so we made sure to arrive quite early. Also, although there was a bus that would get us there at almost exactly the right time, we wanted to get the one before this, in case it was busy/slow. Unusually, our Yamanote line train from Mejiro was delayed so we very nearly missed this early bus. I think it was due to leave at 9:00 and would get us there around 10:00. We didn't know where to get tickets from, but it turned out that we could buy them from the driver when we got on. The trip from Tokyo followed along the Sumida River at first and then continued on a freeway out to Tsukuba. One shocking thing I remember from our trip is that it seemed like many of the truck drivers were watching TV while driving! I'm not sure what was going on there. We arrived more or less on time, and had to make sure to listen to our stop "Namiki Ichoume" (並木一丁目), which sounds and looks quite similar to some of the nearby stops (e.g. Namiki Nichoume - 並木二丁目)- so be careful. After arriving I actually had to quickly whip out my laptop as university class sign-on opened at 10:00 and competition is fierce for the optimal class times. I had two sign on times, today at 10:00 and then another at 12:00- which will occur during the tour. After that ordeal we went into the main complex and found building E-2, which contained the registration desk. After we approached a lady appeared who knew who we were without us having to say anything. We got identity tags and were told to wait in a room at 11:00. As we were quite early we used our time to look at the Planet Cube, which was a small area with some displays and a shop. We also went outside and took some photos of the big H‐II Launch Vehicle rocket on display. 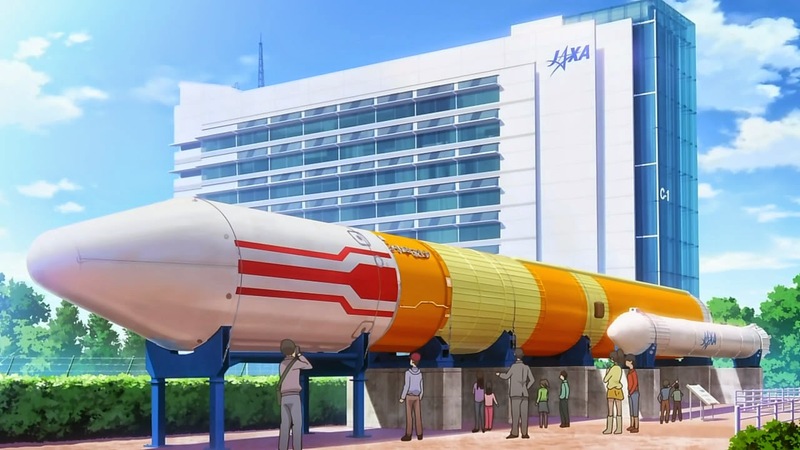 Although we had wanted to visit Tsukuba before watching the Space Brothers anime, having just finished this show a week or so ago definitely enhanced our experience. It's a great series, and I highly recommend it. As expected from our reception, it turned out that we were the only non-Japanese people in the room. The Japanese/English tours as separate so this meant we had our own private tour guide. After meeting her we were taken to separate room to watch a video. In the video a JAXA astronaut talked (in English) about the Tsukuba facility and the Japanese space agency. After the video we re-joined the Japanese tour and took a bus over to a different building. Upon arrival we split up again, and went into a room where we were told about some special space fish (used for experiments), the food used in space and an angled table that simulates the effects of Zero-G on the body. It leans back at a six degree angle, and astronaut stay in that position for many days/weeks before going to space. We could actually try it out ourselves on a inclined plane in front of the bed. Our tour guide read from a script she had and it was a bit hard to understand at times, but we listened attentively. After this room we went back out into the main building area and had a look at a space suit display- like the rocket this was featured in the Space Brothers anime and we tried to look into the helmet to get a reflection of our face in the suit- unfortunately the image was way too small. I guess it works in anime land because their heads are so much bigger. After the suit we went over to have a look at the training module, which looked exactly like it did in the show! However there was only one in reality (not three). In the viewing room tere was also a little model that let us see inside better. Our tour guide noticed that I could read some Japanese and mentioned that if Japanese is spoken it's possible to do a paid tour that includes wearing a space suit and doing some of the same training that the astronauts do! After this room we got back on the bus and were taken over to the Exhibition room. This room is the main tourist attraction of the Tsukuba Space centre and you don't need to book a tour or anything to visit. It was really big inside and was filled with lots of satellites and space probes! It was easily the most interesting and cool room of the facility- and very shiny with lots of gold and silver foil. Our tour continued in here as our guide stopped at each display and gave an explanation. She showed us that the foil was held on using velcro and let us touch some on one of the satellites. There was even a copy of the International Space Stations Kibo module that we could climb inside and have a look! Another interesting display was a Rocket Engine and the lady explained that the nozzle and outer casing is cooled by pumping the liquid rocket propellant (extremely cold liquid Oxygen/Hydrogen) along pipes on the outside before they are ignited inside. The Japanese experimental Kibo module of the ISS. This is the ISS's largest module. Other displays included many different probes, satellites, launch vehicles as some models detailing the history of rocketry in Japan. Oh and halfway though I unfortunately had to excuse myself to sign on to my other classes. Once we had been shown all the displays the tour was over and we thanked our guide. Before heading back over to the shop we had another look around the displays and Kate showed me the ones I had missed. At the gift shop we bought some souvenirs! I got a little piece of a meteorite and Kate got a pencil and some canned bread. One of the things you could buy was a cool puzzle that was completely white with no image; this is used to train the astronauts and was featured in Space Brothers. I wanted to buy it, but I don't normally do puzzles so I passed it up. On the way out of the Space Centre Facility we tried to visit the cafeteria, but gave up as the process (get a new visitor ID tag back in the main office) seemed to difficult. So we instead got the next bus to Tokyo and got off near Ueno Station. For a late lunch we found an interesting soba restaurant where we could choose what food we wanted to add to our noodles. Both Kate and I got some ebi (prawn) and some weird sort gluggy yam stuff. At one of the nearby restaurants we were very surprised to see some people we'd seen yesterday at Mt Fuji! I have no idea how many people we see each day but in a city of tens of millions it was amazing to see someone we'd seen in a different area like that. I wonder how often we see the same person twice but just don't realise. After lunch we went back to the hotel, and had bit of a rest before venturing out again to Ikebukuro for some Karaoke! After arriving we first had a look at the Animate, which is the chains' flagship store. We spent some time looking at the many different floors. After that we were then disappointed to find that the nearby Big Echo karaoke shop was full and had a one hour forty minute wait! Happily though we walked over to another nearby one and found that it had some non-smoking rooms free. We asked four two hours and this time made full use of the drinks and food available. We got hot chips, edamame, sake, malibu cocktail and more. I sang some fripside songs and various others. It was a bit expensive at 6000yen total, but not really considering the amount we drunk! Only 3000yen ($30) each so we were pretty happy! After our time was up, we caught the train back to our hotel for our last night in Tokyo! Tomorrow we'll be travelling up to Minakami for some handicrafts at Takumi no Sato.